Hard to Find. Not available to order. Call or email for used stock availability. 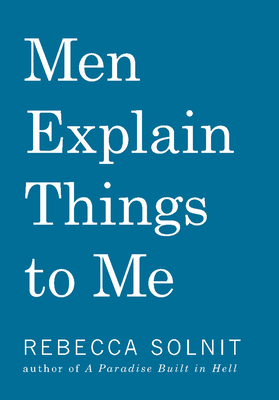 In her comic, scathing essay "Men Explain Things to Me," Rebecca Solnit took on what often goes wrong in conversations between men and women. She wrote about men who wrongly assume they know things and wrongly assume women don't, about why this arises, and how this aspect of the gender wars works, airing some of her own hilariously awful encounters. She ends on a serious note-- because the ultimate problem is the silencing of women who have something to say, including those saying things like, "He's trying to kill me "
This book features that now-classic essay with six perfect complements, including an examination of the great feminist writer Virginia Woolf 's embrace of mystery, of not knowing, of doubt and ambiguity, a highly original inquiry into marriage equality, and a terrifying survey of the scope of contemporary violence against women.